Doris Day occupies rarified rare in show business history. In 2009 she became the all-time female box office champ and sixth among the top 10 box-office stars, irrespective of gender. She’s been honored with a Golden Globe, a Presidential Medal of Freedom, the Cecil B. DeMille Award for lifetime achievement in motion pictures, a Legend Award from the Society of Singers and a well-deserved Grammy Lifetime Achievement Award. She has appeared in 39 films, released 29 albums and logged 460 weeks in the Top 40 charts. Though she started her career as a big band singer (her first hit, “Sentimental Journey,” came in 1945), but after director Michael Curtiz cast her in her first film, 1948’s Romance On the High Seas, she was suddenly a movie star as well. Sometimes immensely gifted artists are undervalued because they go about their work with such ease; Doris Day had that effortless style to go with a wholesome girl-next-door image that, even as the box office receipts piled up, led critics to deride the virginal qualities she projected onscreen. Oscar Levant uttered the most famous dig, saying he knew Doris Day “before she was a virgin.” Annoying, uninformed and unfair, such criticisms ignored the range of roles Ms. Day tackled with flair and the progressive female characters she brought to life on screen well ahead of women’s lib gaining steam. Doris Day and Rock Hudson in Pillow Talk (1959), featuring Day singing ‘Possess Me.’ Ms. Day’s performance earned her Golden Globe and Academy Award nominations as best actress. Ms. Day herself addressed the image issue in her 1975 autobiography. Doris Day: Her Own Story, in noting: "The succession of cheerful, period musicals I made, plus Oscar Levant's highly publicized comment about my virginity ('I knew Doris Day before she became a virgin.') contributed to what has been called my 'image,’ which is a word that baffles me. There never was any intent on my part either in my acting or in my private life to create any such thing as an image." Doris Day, ‘It All Depends On You,’ from 1955’s Love Me or Leave Me, directed by Charles Vidor and co-starring James Cagney. Now 87 and devoting her time, as she has since the early ‘70s, to animal welfare activism, Doris Day has seen her reputation slowly but surely being burnished to its proper bright sheen, with her movies being reconsidered in light of their solid performances and subtle messages of female empowerment. Next, a greater appreciation of her truly formidable musical achievements will be in order. Which would take her back to where she began her journey, back to first aspirations long since fulfilled. Early on, she was aiming for a career as a dancer, a dream derailed when her legs were severely injured in a car accident in 1937, after which she started taking singing lessons, and at age 17 began performing professionally around her home town of Cincinnati. In 1945, while working with bandleader Les Brown, she had her first hit record, a big one it was, too, in “Sentimental Journey,” now one of the beloved songs in the Great American Songbook. In 1948, though, fed up with the business and having separated from her second husband, Day was ready to go back home to Cincinnati when her agent persuaded her to join him at a party at the home of composer Jule Styne. We now have Styne and his collaborator Sammy Cahn to thank for one of the truly remarkable recording careers in pop history. When she sang “Embraceable You” at the party, Styne and Cahn recommended her for a role in the film they were working on, Romance On the High Seas, which produced another hit for her in “It’s Magic.” The movie roles came regularly and with them great songs--by 1953 she had notched her fourth chart topping hit in the wonderful “Secret Love,” from Calamity Jane. In 1956, her role in Alfred Hitchcock’s The Man Who Knew Too Much gave her a signature song in “Que Sera, Sera (Whatever Will Be, Will Be),” which Day reportedly despised but which became her theme song, and showed up in two other of her movies, 1960’s Please Don’t Eat the Daisies and as a duet with Arthur Godfrey in 1966’s The Glass Bottom Boat. Her last top 10 hit came in 1958, with “Everybody Loves a Lover,” but she continued recording into 1967, with her final LP being The Love Album, which did not see a commercial release until 1995.She has recorded more than 650 songs; all are not gems, of course, but her voice had personality to burn and a sweet charm that would not be denied. She didn’t do melancholy; hers was an incessantly sunny disposition--feel-good music (before the term was coined) that made you feel like this singer was your friend and confidante, speaking directly to you in a friendly, welcoming tone, and thus bringing you into her confidence. 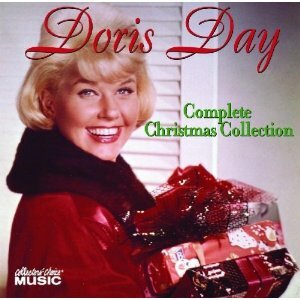 Only one Doris Day Christmas album exists, from 1964, and its title is as straightforward as her singing: The Doris Day Christmas Album. The folks at Collectors’ Choice, however, have included another nine tracks of Christmas fare, most from non-album singles sides, and put it all together on one CD as Complete Christmas Collection. It’s pretty amazing and pretty much beyond criticism--oh, you can hear her strain for a couple of fleeting moments when she tries to belt out a refrain, but she quickly reins it back in and makes a smooth, seamless transition back to the original melody line and to the vocal place where she thrives. The first dozen cuts on the CD are from the album proper, and feature wonderfully low-key, richly textured orchestral arrangements by Frank Comstock and/or Pete King. Her “I’ll Be Home for Christmas” is a breathtaking balance of subdued, thoughtful singing on Day’s part over a sumptuous, perfectly calibrated string-rich arrangement--one of the best versions ever of this holiday chestnut. Her tender “Snowfall,” with its cascades of strings and muted, heralding horns, achieves an ethereal quality on the strength of Day’s impressionistic musings on the fanciful, whimsical nature of snowflakes and the beauty of their appearance--it’s the model for a similarly poetic discourse four years later by Tony Bennett on his classic Snowfall album. Doris Day, ‘Christmas Story,’ from the 1951 film On Moonlight Bay, directed by Roy Del Ruth, co-starring Gordon MacRae and loosely based on Booth Tarkington’s Penrod stories. In 1953 the entire cast returned for a sequel, By The Light Of the Silvery Moon. Interestingly, the span of years represented by these recordings happens to chronicle the singer’s maturation as a song stylist. On the earliest cut, a 1946 rendition of Mel Torme’s “The Christmas Song” heavier on horns than the usual arrangement of this standard, Day staggers her phrasing, singing behind and even ahead of the beat at points and sharply clipping the lines at the end of stanzas instead of flowing along with the melody before taking a breath to start another verse; contrast this with the version on her 1964 Christmas album: the vocal is smooth and creamy, she’s stretching out certain passages, adding extra syllables and subtly playing with the tempo. The voice is older, of course, and has a weight absent from the chirpy youth of 18 years earlier, but with that also comes a more reflective, knowing subtext--listen to the clipped, upbeat “though it’s been said/many times, many way/merry Christmastoyou,” as opposed to the later version’s graceful, low-key “merry Christmas…to…you,” as comforting as it is heart tugging. Despite her squeaky clean onscreen image, Day had plenty of turmoil in her personal life (four marriages, for starters), and there was a reason Oscar Levant once said he knew her “before she was a virgin.” But whereas her friend and contemporary Frank Sinatra--who admittedly recorded far more Christmas material far longer into his life than did Day--brought a measure of his own personal pain and regrets to his later seasonal work, Day leaned towards being either swooningly romantic--most tantalizingly in her dreamy, torch rendition of “Let It Snow! Let It Snow! Let It Snow!”--or playful and frisky, as she demonstrates with a gentle but smoldering treatment of “I’ve Got My Love To Keep Me Warm”; you won’t hear Sinatra’s swagger in her version of “The Christmas Waltz,” but you will hear sincere good tidings with a frisson of flirtiness, a little personal twist, a tinge of romantic possibility in her sunny tone. Almost every song has something in it to grab the attention, whether it be the seductive, deliberate approach to “Toyland,” so full of wonder, or the sincere, spiritually resonant reading of a call for fellowship, tolerance and unity in “Let No Walls Divide,” a 1961 cut off a Christmas album featuring an all-star lineup of Columbia recording stars. Wonderful technique is at work in all of Day’s recordings, but what she wrought in her Christmas material is something beyond technique, something abiding in the exalted realm of the heart, where pure feeling produces the peace that passes all understanding. This is beautiful.